Business websites are like snowflakes – no two are alike. Even when you consider businesses in the same industry like Target and Wal-Mart, or Coca-Cola and Pepsi, or Re/Max and Coldwell Banker. Even though websites for businesses within the same industry are very different, they each have the same core elements. Target and Wal-Mart both have ways to search for and order products, store locators, employment opportunities, and are heavily branded. Coca-Cola and Pepsi both have ways to learn about their products, employment opportunities, entertainment, and are heavily branded. Re/Max and Coldwell Banker both have ways to search for homes, find a brokerage, search for an agent, employment opportunities, and are heavily branded. Every website is different. But within each industry, each website is made up of the same parts. Just like every snowflake is different, but each one is made out of water. Websites for Realtors are different from websites for any other type of business. Why? The real estate business is unique. Realtors leads and clients have different needs than customers of other industries. A Realtor’s website is selling the Realtor while providing value to visitors. A Realtor’s business is very local to the few communities that they serve. A Realtor’s business relationship with their clients is more personal than in other businesses. IDX is the way that visitors can search the local MLS on a Realtor’s website. Leads and existing clients go to the internet to search for homes, so a good website gives them a reason to do just that. And a good IDX system will provide SEO benefits as well to help with Google, Yahoo, and Bing searches. If the purpose of a Realtor’s website is to generate leads, a visitor that finds the website needs a reason to become that Realtor’s lead. The About Me page is the best way for a Realtor to sell themselves. And About Me pages are generally the most visited pages on most websites. Potential leads want to learn about the Realtor. An About Me page is the Realtor’s opportunity to sell themselves by letting leads know how the Realtor will help them. Do you know why review sites like Yelp and TripAdvisor are so popular? Because people trust the opinion of random people. It is called social proof. The more positive reviews the better. Before contacting a Realtor (or most other businesses), potential leads want assurance that past clients had a great experience. Some of the best testimonials should be presented on the home page, and there should be a Testimonials page to show the rest. Gotta give visitors a way to contact the Realtor. Believe it or not, a lot of Realtor websites leave this out. That makes me cringe! Realtors need to show that they are local experts for the communities they serve. A page for each community they serve is just the way to do this. Be as detailed as possible. Visitors will get value from it, and Google will love it. Realtors should think of all the questions that people ask about the communities they serve? Then answer them. What information would be valuable about the communities? Include it. There is no such thing as “too long” when it comes to Community Pages. Many Realtors consider the website that they get from their brokerage to be their personal website. Although these websites technically allow for 3 out of the 5 necessary elements (they usually don’t include community pages or a blog), they are rarely properly maintained to give the visitor any value, let alone allow potential leads to even find it. Above all, a website with a brokerage is not a snowflake. It is identical to every other Realtor’s website at that brokerage. Realtors are small businesses. And every business needs a website that has the critical elements for their industry. 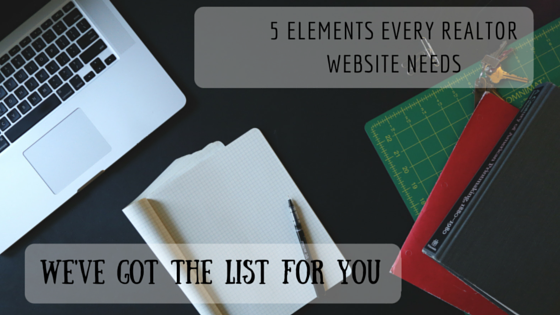 The common element across every industry is for the website to be heavily branded.